As we look to the future, it is important we acknowledge the service of those who have come before us. There have been many who have contributed to the development of St Mary's Cathedral, however it is generally accepted there have been three major construction phases. We wish to gratefully acknowledge the tremendous assistance provided by Sr Frances Stibi PBVM, Archivist for The Archives of the Roman Catholic Archdiocese of Perth for all her help in providing valuable historical information and images which have been used extensively in our appeal materials and within this website. Consecrated Bishop in 1911, his first years were spent reducing the crushing debt the Diocese had accumulated. Under his prudent management, a committee of lay professionals worked tirelessly to balance the accounts. In 1913, during his first "ad limina" visit to Rome, he was appointed as the first Archbishop of Perth. He embarked on a vigorous building program to meet the needs of a burgeoning Catholic community which had been neglected whilst financial matters were resolved. In 1913, ten new churches were opened, as well as three new schools, two convents and a further seven churches, three schools and one convent in 1914. In 1914, the First Great War erupted and years of suffering followed. Though peace was restored in 1918, it wasn't until 1924 that Archbishop Clune could embark on a project very dear to his heart, as he said in his own words "building a Cathedral worthy of Almighty God, of the Archdiocese and of the City of Perth". Until then, it was considered by most that the Cathedral was a place of function, not beauty. He engaged architect, Mr M.F. Cavanagh to design a "beautiful" Cathedral. The Cavanagh design included the magnificent altars and shrines in honour of the Sacred Heart, Our Lady and the Saints. It contained the important additions of the Sanctuary and Transept and the wonderful stained glass windows which now adorn our Cathedral. On the 25th of April, 1926, at a time which eventually led to The Great Depression, Archbishop Clune laid the foundation stone for the third and perhaps final stage of St Mary's Cathedral's development. With perseverance and the loyal toil of many good people, on the 4th of May, 1930, before a crowd estimated at 17,000 strong, Archbishop Clune officially opened St Mary's Cathedral - our Cathedral. Archbishop Clune served until his death in 1935. He will be remembered for much - his dedication to serving the poor, the needy and his love of Church. He was known as a brilliant and intelligent speaker, a man with great personality who was loved and respected throughout the community. However, it will be his living legacy of building St Mary's Cathedral which will stand through the ages. Bishop Gibney was the Coadjutor Bishop and succeeded to the See of Perth on Bishop Griver's death. Times were hard, almost a depression. Suddenly, gold was discovered at Kalgoorlie and Western Australia boomed. The number of immigrants arriving at Fremantle increased dramatically – most were Roman Catholics. With State Aid cut, Bishop Gibney found he had an urgent need to provide new churches, schools and hospitals. As a result, he needed also to provide priests, teachers and medical staff for these facilities. This led to the arrival of the Religious Orders in WA. 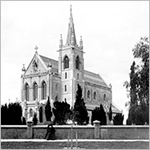 A major building program was undertaken throughout the Diocese such as St Mary's Church, Kalgoorlie, SJOG Hospital and the Convent of Our Lady of The Mission, Highgate – now the Catholic Pastoral Centre. Bishop Gibney decided St Mary's Cathedral also required additions and alterations. In 1905, a new look St Mary's Cathedral emerged with the adding of the porch, the slate clad steeple, the gargoyles and electricity. One significant addition was the statue of Our Lady which still, today, is such a recognisable icon at the top of our Cathedral. Bishop Gibney resigned in 1910 and lived peacefully at 50 Vincent Street, North Perth (now known as Gibney House) until his death in 1925. On the 18th of April, 1859, Bishop Serra, Apostolic Administrator for the Diocese of Perth, requested that Arthur Kennedy Esq., Governor of Western Australia, provide a vacant block located within Victoria Square which seemed ideal for establishing a Cathedral. The land was granted in a letter dated the 13th of August, 1859, which arrived whilst Bishop Serra was en route to Rome. In Italy, Bishop Serra set about gathering donations and materials to embellish the interior of the planned Cathedral. The Benedictines of the Monastery of St Paul's Outside the Walls donated marble for the altar. Unfortunately, Bishop Serra was never to return to Perth or to see his grand plan realised, as he was sent by the Holy Father to Spain where he founded a women's religious order called the Oblates of the Holy Redeemer. In Bishop Serra's absence, Fr Martin Griver, the acting Apostolic Administrator, was the driving force behind St Mary's Cathedral's development. Father Griver was responsible for overseeing the construction and raising the much needed funding. The first Foundation stone for St Mary's Cathedral was laid by Bishop Salvado of New Norcia on the 8th of February, 1863. The Cathedral of the Immaculate Conception of the Virgin Mary was blessed and officially opened by Father Griver on the 29th of January, 1865. Father Griver was finally appointed Bishop in 1869 and died in November, 1886. Sir Frederick Broome, Governor of Western Australia, gave permission that Bishop Griver be interred in "his Cathedral".